Being injured on the job is a very serious issue. One, you have to worry about who will pay for your medical bills? Two, will there be a copay involved? Three, if I’m off work due to the injury, how will I be able to support myself and my family? Four, what if I’m not able to return back to work? Five, will my employer be upset and try to fire me? Six, what if I’m permanently disabled as a result of this injury? Seven, how much is my injury worth? Is my injury on the job worth filing a workers compensation case for? All of these questions are legitimate and good concerns, and a worker or employee should be concerned Luckily, in the State of New York, laws have been created to protect injured workers in case they get injured on the job. These laws fall under New York’s workers compensation system. Essentially, workers compensation is a form of compensation that allows employees and workers to file a workers compensation claim against their employer for being injured on the job. Instead of filing an individual claim against their employer in civil court, the sole remedy is to file a workers compensation claim against the employer’s workers compensation insurance policy. To employers, the workers compensation laws are beneficial because they do not run the risk of being sued by their employees. Your employer pays a certain amount into workers compensation insurance throughout the year. If an employee is hurt on the job, the workers compensation system then pays a certain amount depending upon what type of injury is suffered. The benefit of paying workers compensation insurance is the employer does not have to worry about being sued by their employees due to an on the job injury. Rather, if you want to make a claim against your employer for your work-related injury you must go through the workers compensation process and cannot sue them in court. However, this doesn’t mean that you can’t sue if you were injured at work. When an injury is caused by someone who is not your employer or co-worker, you are still entitled to recover all the damages you have suffered from the work accident. For example, this may also include work injuries caused by a car accident that you may be involved in while you were riding in a vehicle on the job, or a defective piece of equipment at your workplace. This applies even when you have recovered workers compensation benefits from your employer for the same injury. A very common example of this is when multiple contractors are working on the same job site and a contractor from one company negligently causes injury to a contractor from another company. In such a case, the injured person may be entitled to both workers compensation benefits from his employer, as well as compensation from the employer of the contractor who caused the injuries. Probably the best benefit for a injured worker when trying to prove or pursue their workers compensation claim is that the workers compensation system is looked at as a “no fault system” which means that injuries are viewed as an unavoidable aspect of work relationships and there is no need to prove that your employer or a certain person caused your injury. What Does Workers Compensation Allow For? 1. Payment of Medical Bills. Rather than the worker or employee being responsible for their own medical bills or having bills, the employer, or more importantly, the employer’s workers compensation insurance, is responsible for any and all reasonable and necessary medical treatment related to the injury. Whether it’s the initial emergency room visit, MRI, authorization to see a specialist, or even if there is a gap in treatment between the injury date and the medical treatment, New York requires that if the medical treatment is related and reasonable to the injury, the employer’s workers compensation insurance policy must cover all of the medical costs. In addition, should the worker or employee pay anything out-of-pocket related to their medical treatment, such as prescriptions or handicapped devices, the employer’s workers compensation insurance policy must reimburse the worker / employee. As such, the injured worker should always keep copies of their receipts of anything they pay out of their own pocket as far as it relates to medical treatment. This does not mean, however, that reimbursement is for everything or anything. It may not cover travel expenses to and from the health care facility or having to pay for childcare services since you are unable to take care of your children by yourself. Accordingly, it’s always a good idea for a worker to consult with an experienced work compensation lawyer to determine what can and cannot be reimbursed. 2. Temporary Total Disability Benefits. If you are unable to work as a result of being injured on the job, and are owed a percentage of your average weekly wage. This is important because if you are unable to return to your job, you can receive weekly TTD Benefits to live off of while you are off work and are recovering from your injury. The best way to prove that you are off work and are owed TTD Benefits is to keep a copy of any off work note from your physician and then to give another copy to your employer. The employer will then turn that off work note into the workers compensation insurance company so that they will then issue you your weekly TTD Benefits. Oftentimes, an employee will be receiving TTD Benefits and then the workers compensation insurance company will send the employee to an independent medical exam or “IME” for the purpose of getting an “independent” medical opinion to determine a number of issues. This may include, but is not limited to, answering whether the employee should continue to received TTD Benefits, whether the employee should remain off work, whether the employee’s current symptoms and diagnoses and causally related to the work injury, whether the employee is permanently disabled, and whether the employees prior medical treatment is reasonable and necessary. Should the IME physician determine that the employee should not be off work and should return to work full duty, the insurance company will most likely suspend and stop the employee’s TTD benefits. As such, it is very important that an injured worker consult with an experienced and knowledgeable workers compensation attorney right away to determine the best strategy to deal with an IME. These IME physicians are sometimes referred to as “hired guns” who have a relationship with insurance companies and their attorneys and often perform several IMEs a month or even every week. A significant portion of their practice consists of IMEs, and an experienced workers compensation attorney will know how to approach an IME, both before and afterwards. In addition to IMEs, a insurance carrier may also suspend or stall TTD Benefits simply because of being overloaded, not having the off work note, or not having all of the information, such as the medical records. This is a very common occurrence and oftentimes an employee will not be receiving their TTD Benefits, their rent, mortgage, or car payment, simply because the insurance company won’t return any of the employee’s phone calls. In these situations, an injured worker should consult an experienced, but more importantly, not-take-no for an answer workers compensation attorney. Such an attorney will keep calling the adjuster of the insurance company who is handling your claim until they get a hold of the adjuster and find out why the worker is not receiving their benefits on time. Again, it could be a simple matter of the adjuster not having the off work note, medical records, or perhaps the claim has been denied. Whatever the reason, an experienced and diligent workers compensation attorney will keep on the phones. Furthermore, should the adjuster ignore the attorney’s calls, voicemails, emails, and letters, the attorney will know how to file for a hearing so that your TTD Benefits can be addressed. Should you sustain some type of permanent disability as a result of your work injury, New York allows you to be compensated depending upon how permanently disabled you are. These are called permanent disability benefits. While most injured workers may sustain a partial or temporary disability, sometimes, an injured worker may become totally or permanently disabled. In these permanently disabled situations, the worker is unable to return to their current job, but they are also unable to return to any type of employment. Obviously, these type of injuries are worth more monetarily than partial disability. Contrary to popular perception, when it comes to workers compensation benefits, pain and suffering is very difficult to recover. Generally, the employee cannot sue the employer for pain, suffering, disability, or for causing an employee’s injury. The only benefits that the injured worker usually recovers are wage-loss benefits and medical expenses for the work-related injury. An injured worker should consult with an experienced workers compensation attorney immediately to determine what type of permanent disability benefits they may qualify for and to provide an educated estimate about the value of their injury. 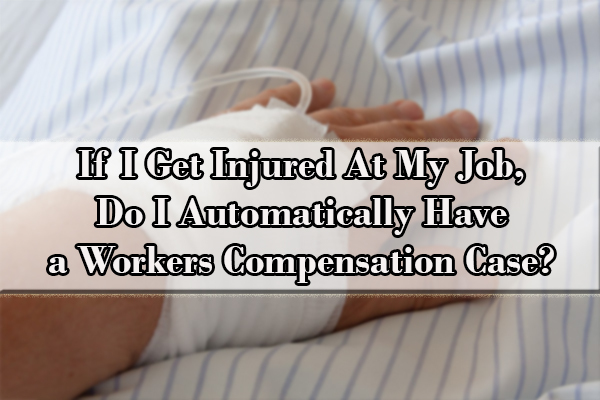 If I Get Injured At My Job, Do I Automatically Have a Workers Compensation Case? Like any case, including workers compensation cases, whether one has a case or not is always fact specific, which means that it depends on the facts of each case. 1. Arising In the Course of Employment. A very common reason for denying a workers compensation case is if the injury does not arise in the course of employment. Just because the injured worker may hurt themselves at the job, does not always automatically mean that they qualify for workers compensation. The injury must be related to the job in that it is unique to the job and that the injury is not something that the general public would be exposed to. For example, if a injured worker was going to the bathroom, and they tripped over their feet causing them to fall to the ground, this injury may not “arise in the course of employment” because the injury is not such that is so unique that the general public would have no exposure to such an injury. However, if the same injured worker was going to the bathroom, and they tripped over their feet causing them to fall to the ground, but they were carrying something at the time, such as a box of materials, then that injury is more likely to have “arisen in the course of employment” than the prior scenario. Accordingly, the injured worker should contact an experienced and knowledgeable workers compensation attorney to be able to determine the different legal nuances and applying the application of the law to your particular facts to determine if you have a valid workers compensation case or not. Another common reason for insurance companies denying a claim is if the injured workers had a prior preexisting condition to the same body part that was injured. For example, if a injured worker had prior back problems, perhaps even received chiropractic treatment years earlier or even had surgery, the insurance company may try to argue that the current symptoms experienced by the injured worker are not from the most recent accident, but are from the preexisting condition. However, an experienced workers compensation attorney will know to argue that the injury could have permanently aggravated your preexisting condition. Accordingly, an injured worker needs to contact an experienced injured workers compensation attorney right away to show how to prove that the preexisting condition was aggravated. The insurance company may argue that the claim is denied because the injured worker had been drinking alcohol at the time of the injury and that it was the injured worker’s fault for the injury. b) that the employer knew and was aware that the injured worker had been drinking alcohol and allowed such drinking to persist. If the employee drank alcohol and drinking alcohol was a normal and customary part of the job and that employer knew about it, then alcohol may not be such a bad factor that would cause the claim to be denied. Sometimes, the insurance company may try to argue that the injured worker is not an actual employee of the employer, but is really an independent contractor, and therefore does not qualify for workers compensation benefits since they are not an actual employee. They may make the claim that the injured worker was paid in cash and thus was an independent contractor. In New York, however, there are a number of different factors in determining who is or is not an employee versus an independent contractor. The most important factor is the control the worker had over their own employment. Was the injured worker in control of themselves or did the employer have more control over the worker? This is oftentimes a factual issue, and an experienced workers compensation lawyer will know how to apply the facts to the law to see if the injured worker can be considered an employee rather than an independent contractor. When I Might Need a Work Injury Lawyer? You should always consult a work injury attorney as soon and as early as possible. Doing so not only will help deter and prevent denial or future derailment of your case, but it also provides the “preventive care” to your case that you need. Oftentimes, an insurance company will require that you give them a statement of what happened or that you must fill out a written accident report to your employer. If the statement or accident report is not made properly, the insurance company may use your statement and your own words against you to deny your case. As such, it is important that you consult with a workers compensation lawyer early on so that your case can be on the right track. However, there are other times when you should consult and retain a workers compensation attorney right away. • You receive a letter from the insurance carrier denying your claim. • You have significant pre-existing disabilities. • You wish to dispute an adverse decision made by your employer, your employer’s insurance company, or your state’s workers comp division regarding your workers compensation claim. • The insurance company won’t return any of your phone calls. • You believe you are not receiving the correct amount of benefits and wonder if there are additional benefits you should be receiving. • Your disability benefits have been temporarily suspended or stopped. • Your medical benefits are denied and they will not pay for any more medical treatment, including surgery. • Your employer has disputed a decision made by your state workers comp division. • You do not understand the complexities of the workers comp process and would feel more comfortable if an expert were representing your interests and answered your questions. Always remember that if you have any questions or the process of filing a claim is unclear to you, it is better to seek legal assistance before getting in the process of getting the compensation. This is especially important in the case of serious damage to your health. If you feel that your life will be permanently altered, either because of permanent bodily impairment or a change in ability to work, a lawyer will be able to advocate on your behalf to ensure that you receive the medical care and workers compensation benefits you are entitled to. In addition, if your injury may keep you from working permanently, a workers compensation lawyer can advise you about filing for Social Security disability benefits as well. • Your workplace injuries are significant and severe enough to require surgery. • Your workplace injuries are moderate to severe. If you and your doctor believe your health won’t return to the condition it was prior to your injury, you may be entitled to a “permanent partial disability” award. • You believe you are no longer able to work on a regular basis in any job and that you are permanently and totally disabled. • You believe you cannot go back to work at your present job but believe you could work in some level or capacity. What Should I Do If I’ve Hurt Myself At Work? 1. Report your injury to your supervisor immediately, no matter how big or small the injury. Also, it is much better to report in writing and keep a copy of the report for your records. 2. You should seek immediate medical attention. Your health is your priority and even if it’s just a small scratch, you should have your injury examined to avoid infection. 3. Make sure you document everything. It is important to write all the circumstances of the injury while you remember them. 4. Maintain all medical bills and receipts that prove your injury-related expenses. 5. Complete an incident or accident report immediately. This way there is a written record of your work injury. You’ll want to do this no matter how serious the injury is. 6. Consult a workers compensation lawyer right away so that you’ll be aware of the rights you have. Can I Be Fired From My Job For Filing a Workers Compensation Claim? It is illegal for an employer to terminate or discriminate against you based upon your worker compensation disability or filing a worker compensation claim. This is illegal discrimination and your best solution would be to contact the appropriate state or federal agency and file a claim against your employer. 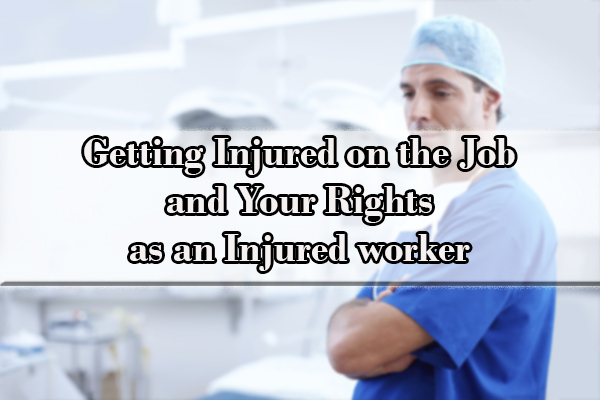 Again, an injured worker should contact an experience workers compensation attorney to determine what rights you have, should this occur. If you become the victim of a work injury, it is better to ask for a legal advice to know what you’re entitled. New York job injury lawyers of The Law Office of Yuriy Moshes help those who became injured in the workplace. We represent clients in the greater New York City area including all its boroughs (Manhattan, Brooklyn, Queens, the Bronx, and Staten Island) as well as Northern New Jersey, Long Island, and upstate New York.